CDA? What’s that? The Child Development Associate (CDA) Credential™ is a nationally recognized credential in the early childhood education field and is a stepping stone on the path of career advancement for family child care providers, center-based or school setting staff. Demand is high for quality child care providers and earning your CDA is a mark of professionalism that is widely respected. It gives assurance to parents and administrators that they have hired a qualified individual to care for their children. Whether you’re just beginning your career or an established provider looking to grow your program, we offer a six-month CDA course that will give you the confidence and motivation to advance your career as an early childhood educator. The Child Care Solutions CDA Program is a unique combination of training and mentoring. This dual approach supports the CDA candidate while focusing on quality improvement within their program. What does it cost? Child Care Solutions’ CDA program is $1500, including a non-refundable $50 registration fee. However, many students are eligible for the Educational Incentive Program (EIP) to help cover the cost. Click here for more information on completing your EIP application for the CDA course. Funds for CDA training are also now available through CSEA/VOICE for registered & licensed FDC/GFDC providers. Please contact CSEA/VOICE directly for more information. Next CDA Session Begins January 8, 2019! 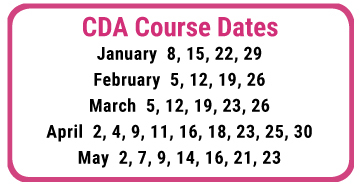 The next session of our CDA course will begin on Tuesday, January 8, 2019. You may download the registration and information packet here. This session’s classes will all take place at our Syracuse office (6724 Thompson Road) on Tuesday & Thursday evenings from 6:00 PM - 9:00 PM, with the exception of one Saturday class (3/23) which runs 8:30 AM - 2:30 PM. 1. Download a copy of the current registration and information form here. Please print and complete the form, including the “Understanding the Financial Responsibility of Your CDA Course” section – this must be signed and dated. 3. Submit your signed registration form to Child Care Solutions at the address above. You may mail this form in with the non-refundable registration form, mail separately if paying online, or bring to the first class of the session.